What’s? – Magnum Lock | G-GOTOH Ltd.
What’s? – About Magnum Lock. 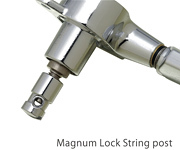 Gotoh Magnum-lock is a locking apparatus to ease installation of guitar steel strings. and prepared for all of SG/SD/ST guitar peg series. * Buttons and colors also can be customized as orders are received. GOTOH Magnum Lock is a self locking system by string tension and is a great asset when keeping vibrato-equipped guitars in tune without any string breaking and slipping off. Tuning stability of new Magnum Lock is taken to a next higher level with the introduction of new smaller string holes on 1st, 2nd and 3rd string posts. DSL [ DOUBLE SPEED MAGNUM LOCK® ] PAT. MG and H.A.P.M. of SG510/SD510 series evolve with new double-speed locking. 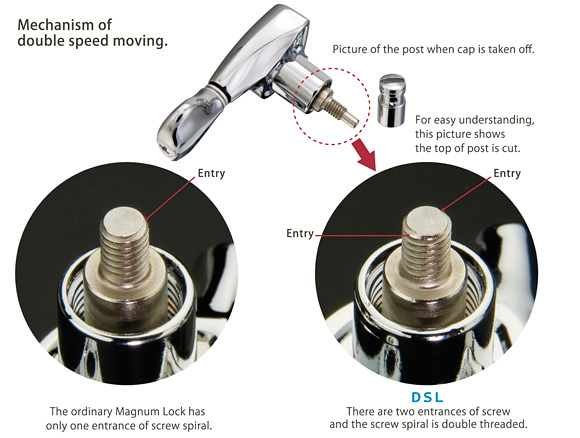 Keeping current appearance and function, it is able to speed up to double for locking by using double threaded screw on locking top. * Double-speed locking on MG and H.A.P.M of SG510 / SD510 series becomes standard specification.